Kampala: A former mushroom and poultry farmer has been crowned Miss Uganda following a major rebranding of the annual beauty pageant, now designed to promote agriculture in the east African nation. Leah Kalanguka, 23, beat off 19 other finalists after a competition that saw the glamour of the catwalk ditched for an army-sponsored boot camp on a farm, where contestants had to milk cows and work with goats and sheep. "The youth will love agriculture because it goes hand in hand with beauty. Right now, farming is mostly done by elderly women," Kalanguka, wearing a gold dress, tiara and a sash, told AFP during yesterday's awards ceremony. Leah Kalanguka, 23, beat off 19 other finalists after a competition that saw the glamour of the catwalk ditched for an army-sponsored boot camp on as far, where contestants had to milk cow and world with goats and sheeps. After years of following the more traditional beauty pageant formula, organisers applied the theme of 'promoting agriculture entrepreneurship among the youth' to the event and partnered with the Ugandan army -- which has major business interests in agriculture. "It's a great direction because the agriculture sector has great opportunity for jobs, so I'm simply grateful that it took that direction and I would really love to see it promoted in our country because it is the backbone," Kalanguka commented. At the awards ceremony, finalists were quizzed about farming on stage. One contestant, Sheila, was asked "what opportunity can family farming represent for the youth?" She replied promptly: "If you're a youth or a young child and you notice that your family is carrying out agriculture it would motivate you to go on carrying on the same thing." Co-host Roger Mugisha, a Ugandan radio presenter, told the audience that Miss Uganda "has to represent Ugandan values". "Agriculture is a Ugandan value and we salute that," he said. Kalanguka, who has studied computer engineering and science at Makerere University in Kampala, where she lives, said she was "so happy" and "overwhelmed" to be crowned Miss Uganda -- which saw her win a small car. "I did not expect this to happen," gushed the winner. Organisers said the top finalists will eventually be used to market produce including potato flour, mango juice, cornflakes and honey. AKWAABA � African Travel Market,� Nigeria�s premier tourism and travel trade show, which this year will take place from October 26-28 in Lagos, will for the first time welcome the Uganda Tourism Board and a number of Ugandan stakeholders. Arguably spurred by the success that neighboring countries had as a result of attending West Africa�s most important tourism fair, Uganda Tourism decided to throw their own hat in the ring and vie for more visitors from Nigeria and beyond. Being at this tourism trade fair allows to reach a potential of up to 300 million people and with inter-Africa travel on the upswing, supported by airlines like Kenya Airways, RwandAir and Ethiopian all of which fly daily to Lagos, has it become easier to tap into that lucrative market place. Present again from the Eastern African region will be Rwanda and Kenya which have made waves last year. 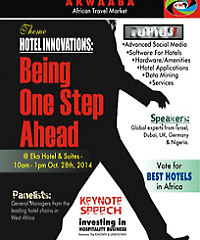 Also part of this year�s program is a dedicated �Hospitality Day� on the October 28 at the Eko Hotel & Suites where innovations in the hospitality business will be discussed be eminent speakers, discussants and hopefully many participants. Notably can prices be scooped at the trade fair for best stand and other categories, giving an incentive for a sharp appearance and committed exhibitors personnel if one is to trump the pack and walk away with a trophy. Certainly good news for Uganda which has always made an impact at tourism trade shows and which many tourism attractions no doubt will appeal to many wannabe visitors who want to come and explore the Pearl of Africa.